Hello everyone! Let me introduce myself real quick…. my name is Natalie and I blog over at What the Teacher Wants with my BFF Rachelle! (You can read more about us: HERE!) I consider myself to be a 5th grade teacher since I taught it (and LOVED it) for 7 years. After having two little babies, I made the switch to part-time teaching and this will be my second year as my school's computer specialty teacher. I miss 5th grade, but am overall loving my new job! 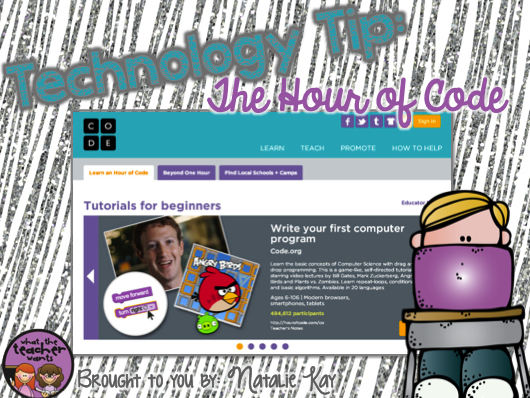 Today I'm sharing a technology tip and something that I'm really excited about. Last spring I got to attend an amazing technology conferece (UCET) where I was inspired in many different ways to implement technology in the elementary classroom as well as find new ideas to teach in my computer classes. The main idea I took away from the conference was: My students need to complete The Hour of Code! Have you heard about it? Here's the short version: The Hour of Code is a fun and interactive way to teach students (starting at age 6!) how to do computer programming! Plus, it's completely FREE! Have you seen this inspirational video? It's only 10 minutes and explains in a kid-friendly way why learning code is so important. I don't know about you, but I don't want to be among the 90% of schools that don't teach any type of computer programming skills. And… here's just a two minute clip you should watch too. Hint: you should watch it just to see Ashton Kutcher. I'm excited to try it and know my students will love it!! Think this sounds like something you would like to try? Would your students benefit from learning code? Have you already done this with your students? Leave a comment and let me know your thoughts! I wish I knew any coding beyond Basic, which I learned in HS. I am passing this on to both our technology teachers. I need this class fir myself first! It's now in my to-do list. But since I know very little, ok, actually nothing, about coding, can you tell me how my 1st graders will benefit from this? Okay! I just completed my Hour of Code! Very exciting. The actual code still looks like gobblety gook to me, though. The little building blocks are great. First graders at the end of the year could probably do it. It reminds me of Apple's original teaching language with the little turtle, Logo. We used to teach it K-5 at my school. I'm in! I am a total novice and have not attended any training, but would love to learn and benefit from your experience. Be still my heart! OH. MY! This is so cool. We actually have an amazing tech program at our school and we are starting a coding class with our Junior High, but so cool that it can be done with little ones too! I did this with my class last year! In fact, almost every class in my K-5 school did this! It was a HUGE success at my school! I teach third and my students LOVED it. It's really a wonderful way to introduce coding and teach problem solving. Best of luck implementing this with your classes! Thanks so much for this post! I've been hearing about it for a few months now and just switched my role to teaching technology this year so I'm hoping to dive in as well! I'll be following your progress! SOOO cool!! It is a little overwhelming! But this seems so amazing I would LOVE to learn and the somehow implement this into my classroom!! We love reading! Do you? Back to School Tips and Timesavers! Are You Ready for Back to School - Teacher Week? Get to Know Your Readers- Free Download! Instagram Scavenger Hunt Prize Bundles, BABY!! QUICK Common Core assessments for tracking data!